What is the likelihood of breaching of the urban flood defences? What are effective design solutions to increase the reliability of the urban flood defences (with a factor 100)? What are potential design solutions for (partially) transforming existing urban flood defences into Multi-functional Flood Defences? How to assess and manage financial, organisational, engineering and operational risks of multi-functional flood defences in an atmosphere of multiple users, administrative rules, and legal frameworks? How to assess the potential need for smart shelters, in terms of capacity and location? What are potential design solutions for transforming public buildings into smart shelters? What is the (cost) effectiveness of smart shelters in terms of reducing the number of evacuees and casualties? How to assess the vulnerability of critical infrastructures and hotspot buildings? What are potential design solutions for resilient critical infrastructures and hotspot buildings? Method and tools for assessing safety of urban flood defences (fragility curve when relevant). The dominant failure mechanisms of the defences around the Island of Dordrecht are internal erosion and overflow. The CoD is looking for a method and tools to assess in which circumstances the overflow could lead to breaching of the dikes. Design guidance for urban flood defences (delta dikes). Delta dikes are reinforced dikes that are virtually incapable of breaching. 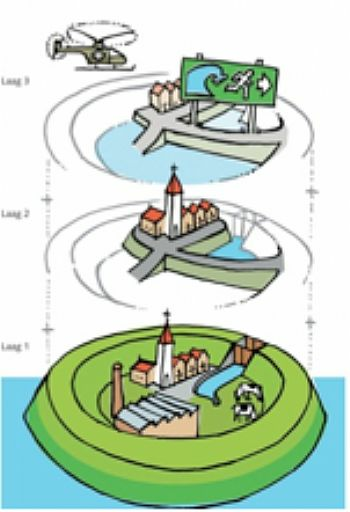 This means that even in the case of a flood event exceeding design thresholds, such a dike would substantially lower the volume of water entering the polder area (Silva and Van Velzen 2008). This can reduce flood extent, depths and velocities. Technologies and design for multifunctional flood defences, together with financial, organisational, engineering and operational principles. Multi-functional flood defences fulfill societal functions (in addition to flood protection) like housing, recreation and leisure, ecology, mobility and transport, underground infrastructure, and are a functional part of their urban or rural environment. The combination of delta dike and multifunctional flood defence is an interesting perspective for the Dordrecht pilot. Technologies and design guidance for smart shelters. Technologies and design guidance for resilient critical infrastructures and hotspot buildings.